Looking for a new spring salad recipe? 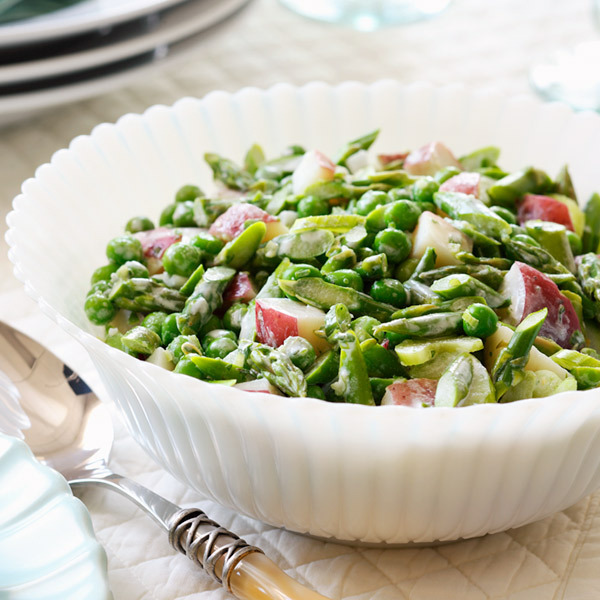 This colorful vegetable salad features red potatoes, asparagus, frozen baby peas and scallions tossed with a zesty dressing. To meld the flavors, let this tangy and tasty side salad sit for at least 30 minutes before serving. Then, stand back and watch as this fresh and flavorful vegetable salad disappears by the spoonful! In a large bowl, whisk together the mayonnaise, lemon juice, lemon zest, tarragon and pepper. In a large pot of boiling salted water, cook the potatoes for 7 minutes. Add the asparagus and cook until the potatoes are tender, about 3 minutes. Place the peas in a colander, and drain the potatoes and asparagus into the colander. Drain well and transfer to the bowl of dressing, and toss well. Add the scallions and rhubarb, and toss again. Before serving, let it sit for at least 30 minutes so that the potatoes can absorb some of the dressing. Kid-approved tweak: Omit the asparagus and scallions. Double up on the peas.